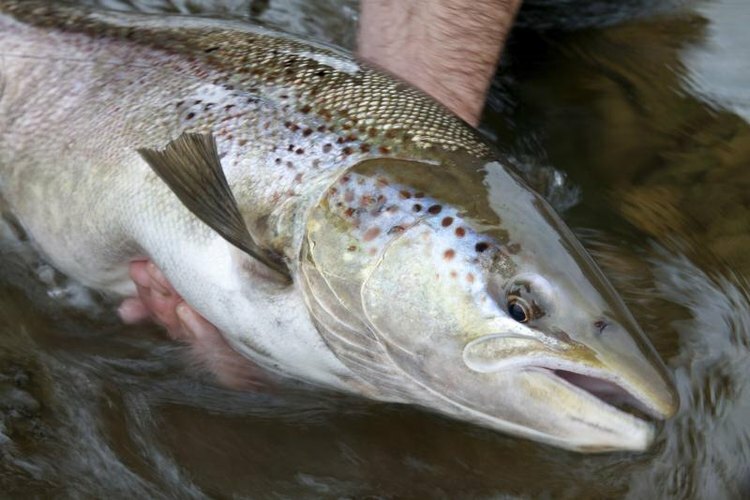 A fisherman holding a large Atlantic salmon. With some species approaching or exceeding 100 pounds in weight, salmon are one of the most exciting targets for anglers. You can catch these aggressive, predatory fish with a variety of different lures and baits, but spoons, crankbaits, cut baits and roe are among the most effective. To maximize your chances for successfully landing a big king, Coho or humpback, you can even use some of these lures and baits simultaneously. Spoons are some of the most popular lures for all types of salmon fishing, including trolling, casting, drifting and plunking. Spoons are flat pieces of polished metal with an attached hook; sometimes, they bear painted stripes or patterns. Spoons are effective because they are highly visible, and they mimic the movements of a baitfish. Use the thinnest spoons possible, since they move more effectively than thicker spoons do. Uncolored spoons are effective, but those with blue or green markings often catch the most fish. Crankbaits are small- to medium-sized lures made of plastic, wood or metal, and they are painted to resemble small baitfish. Most crankbaits have a plastic lip that protrudes from the front of the lure and causes them to dive. Crankbaits work well for triggering salmon to strike, even as the fish are entering the rivers to spawn and have stopped feeding. Select crankbaits that are deep-bodied and exhibit a wide wobble when pulled through the water. The best colors include fire tiger as well as combinations of pink, purple and black. Additionally, crankbaits with red-colored bellies are very effective for tempting salmon from the depths. Real fish are highly effective baits for catching salmon. Pieces of herring, mooching, sardines or shad are some of the most common cut baits. Cut fish can serve as a primary bait when rigged with hooks, or they can be added to spoons or other lures to increase the appeal of these lures. Fresh and brined fish work much better than frozen fish do, as they last longer once hooked and in the water. Salmon and trout eggs are productive baits to use when drift fishing or plunking in rivers. To fish with eggs – or roe, as anglers call it – attach a cluster of the eggs to a small hook. Some anglers use a hook attached to a small cork – called a corky – and a piece of yarn, when fishing with roe. The corky helps to keep the eggs floating off the bottom of the river, while the yarn helps to attract the attention of hungry salmon.